Structured Cabling | Fancom Connects Ltd. Structured cabling in the context of telecommunications refers to the network of copper wire and fibre optic cabling within a facility that connects voice, video and data end devices such as phones, smart boards and computers to each other and the outside world. The term “structured” refers to the components of the overall system that are connected in an organized fashion according to a series of standards that are set out by various industry organizations such as ANSI/TIA BICSI and others. 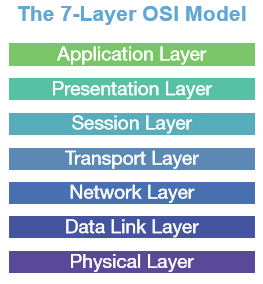 Structured cabling is often referred to as the “physical layer” or layer 1 in the 7-layer OSI model defining certain operating protocols from incoming cable sources to an end device such as a cell phone. The importance of the structured cabling or the physical layer cannot be overstated. It is widely held that as much as 70% of any network malfunction is the result of faulty design and/or installation at this level. All communication devices, regardless of whether they are used in voice, video or data applications, are eventually connected through copper or fibre optic cabling. Even wireless devices eventually can trace their operability to connection with another device through the structured cabling system they are a part of. The structured cabling system in any given building is the catch-all term for the combination of smaller elements including the entrance facility where the building is connected to the outside world. Vertical distribution cabling connects multiple floors while horizontal cabling systems connecting various elements on a single floor, possibly through one or more telecom rooms. These rooms house switches, routers, power sources and other distribution equipment. Cable that connects devices runs along well defined pathways consisting of conduits of varying sizes and material types or other cable containment devices such as lengths of wire baskets hung from ceilings or attached to walls. In some buildings such as data centres, the structured cabling system may run under a raised floor structure. All elements of a well-designed structured cabling system should strive to meet current ANSI/TIA 568-C standards. As cabling can be quite complex often including multiple thousands of cables and hundreds of devices, appropriate labeling of all structured cabling components becomes critical and should follow current ANSI/TIA 606-B standard labelling protocols. There are a wide range of standards, each intended to bring uniformity across all similar installations. The ANSI/TIA 942 standard for example defines installation best practices for all Data Centre related work. Adherence to structured cabling standards is voluntary, unlike codes governing electrical installations which are by law mandatory for the protection of human life and property alike. Structured cabling standards are in place to ensure maximum network performance. Issues such as the minimum allowable bend radius for optical fibre, the maximum allowable length of continuous cable runs and the number of permissible 90o bends in a given cable run are clearly defined in the appropriate standards.